We build houses and schools using revolutionary Earthbag technology, and teach others to do the same. Using the soil from under peoples's feet we help villagers in developing countries build disaster-resistant, affordable and eco-friendly homes and schools, and teach an emerging class of builders, architects and engineers to build safely and sustainably. A year and a half of Good Earth Global design, research and lobbying have resulted in Nepal, population 30,000,000, becoming the first country on Earth to officially accept and adopt Earthbag technology at the federal level! Our Earthbag designs are now published in Nepal’s official Design Catalogue For Reconstruction of Earthquake Resistant Houses, Volume II, and Earthbag construction has become an official option for Nepali villagers receiving government aid. We now seek to export Earthbag technology to all regions in need of safe, sustainable and affordable homes, schools and clinics. Rural villagers typically rely on flimsy, poorly designed structures built out of easily available mud or stone or more costly bricks, cement, and steel, processed in big-city factories and hauled along poor or non-existent roads. In isolated areas the final leg of the journey often involves porters carrying heavy loads of cement or bricks on their backs. In disaster-prone areas homes and schools built of these materials routinely succumb to earthquakes, wind and flood, resulting in broken communities and a tragic loss of life. Ruined homes and schools are then rebuilt in the same old way, and the deadly cycle is repeated. Building this way also proves toxic to the environment, especially in a time of global warming and rising seas. Factories foul our air and pollute our water. Trucks used for transport guzzle gasoline, and belch poisonous fumes. Mining, extraction and the harvesting of timber scar the landscape and deplete precious natural resources. Earthbag technology builds safe, sustainable and cost-effective structures out of ordinary soil from the worksite. Requiring no bricks or blocks and little or no cement, steel and wood, Earthbag homes, schools and clinics substantially reduce reliance on manufactured materials, and the environmentally damaging factories, smokestacks and kilns needed to process them. Building with soil from the worksite also reduces the need for transport, resulting in less fuel consumption, reduced emissions and fewer vehicles on the road. In partnership with Anna University (Madurai, India) we built an Earthbag Meeting Center on campus, and taught Earthbag building to Anna engineering students. Our volunteering program brings together skilled architects, engineers and others highly motivated individuals of varying backrounds, ages and skills. Sponsored International Earthbag Conference in Madurai, India, and delivered keynote address to over 650 participants. Tirtha's husband died of cancer two years ago. She has 6 kids - 5 girls and 1 boy. The oldest son is 15 years old and youngest girl is 2 years old. The house she used to live was damaged by the earthquake. She does not own any land so she has to work as a farmer for other people. This is the only source of her income. There are times when she does not have work and she does not have enough food for her family. In this case her neighbors give her rice and lentils. We are happy that now Tirtha and her kids have new beautiful and safe house to live in. As a part of "Single Women” project we are building a house for Kalpana BK and her 3 kids. Kaplana’s husband died 12 years ago. Her house was damaged during the earthquake. She received $500 from the government as a first installment and started building conventional house. She did not realize that just a foundation cost $1500. Now she is in debt of $1000 and with no house. Kalpana works in the farm of other villagers as a labor. Sponsored by American School of Dubai we are building a house for Him Kumari and her 10 year old son. Him Kumari’s husband left her 10 yrs ago after she got pregnant with his son. She was left completely alone to raise her child. She worked as a farmer for her neighbors. In 2015 her house was destroyed by the earthquake and soon after she fell off the cliff and injured her leg. Now Him is disabled and can not work. Her 10 years old son cooks and takes care of her. He grows green leaves and vegetables in their small piece of land. There is no other source of income for the family. Villagers help them and give rice, lentil and other food items to eat. They are still living in small tin shade. As soon as the earthbag house is finished - they will have a safe place to live. Good Earth Global designed, sponsored and built an Earthbag Meeting Center on the campus of Anna University in Madurai, India. The project will serve as a sustainable building model for future generations of Anna engineering students. In Dhading we completed construction of the Belingtar Primary School. Thanks to our team, volunteers and sponsors Kimberly and Becca for making it all happen and giving the children a safe and beautiful space to study. Kamala, a widow, has two daughters, Nabina and Rabina. We have built an Earthbag house for them. Kamala and her daughters live in Tandrang, a small village in Ghorka, their house was destroyed by the earthquake. Village elders chose Kamala’s family, among many in need, to receive the first house. The Karki Family Earthbag House was a collaborative project with ANSWER Nepal, a US.- based non-profit helping underprivileged children in Nepal, especially young girls, obtain a quality private education. The construction of an Earthbag Elderly Home in Lamakhagar was sponsored by INRAA , a Taiwan based organization which focuses on helping people in the Himalayan areas of India, Bhutan, and Nepal. Our engineer Ram says this project was great because "... the villagers of this community were very cooperative and hardworking. Also the volunteers from Taiwan and Bhutan are very hardworking." Good Earth Global designed and supervised the reconstruction of a two-classroom primary Earthbag school in the village of Samundradevi, VDC-4 , Nuwakot, Nepal. The hilltop school was sponsored by Birds of Passage, an Australian non-profit. We completed eleven houses for our community-based housing project in Bolgaun, Sindhupalchok in collaboration with Nimbin Health and Welfare Association, from Australia. Our community-based model is proving successful, and in Bolgaun and perhaps elsewhere we plan on building many more. In partnership with the Open Institute of Social Science we have built an Earthbag canteen for students. This project has a unique shape that combines 2 semi-circles. The canteen also has 3 attached toilets/showers. This project serves as a model of sustainable building. Good Earth Global designed, sponsored and built a two-room Earthbag primary school in Agra, Makwanpur, Nepal. The cooperative effort brings to life the "Dream Village" vision of Expansion Nepal, a Kathmandu-based NGO. Good Earth Global designed and supervised the construction of a model Earthbag home for sherpa community, Ramechhap. The project was sponsored by the Himalayan Homes Trust, a non-profit devoted to building safe and sustainable homes in Nepal. All building was done by local villagers; the workmanship is exceptional. In Nuwakot we built the Butterfly Learning Center. The Butterfly serves as a safe and appealing space for kids to do homework, read books, and pursue various forms of artistic self-expression, and will also host adult literacy, health and hygiene classes, and women's empowerment workshops. Noted artist Sushil Babu Chhetri conceived the project, and we thank Jennifer Dahlem and Kevin L.H. for their sponsorship. Good Earth Global designed and rebuilt a two-room primary school in Phulping, Sindhupalchok, Nepal. The Earthbag school was funded by the 108 Lives Project/Three Jewels Outreach Center, a New York City non-profit. For this project we reused the original foundation, windows, doors, metal roofing and steel posts. Wrapping the Earthbag courses around the posts, "The design is very strong because the steel frame braces the Earthbag walls, and the Earthbag walls and buttresses reinforce the steel posts", according to Dr. Owen Geiger upon his evaluation of the progress made. 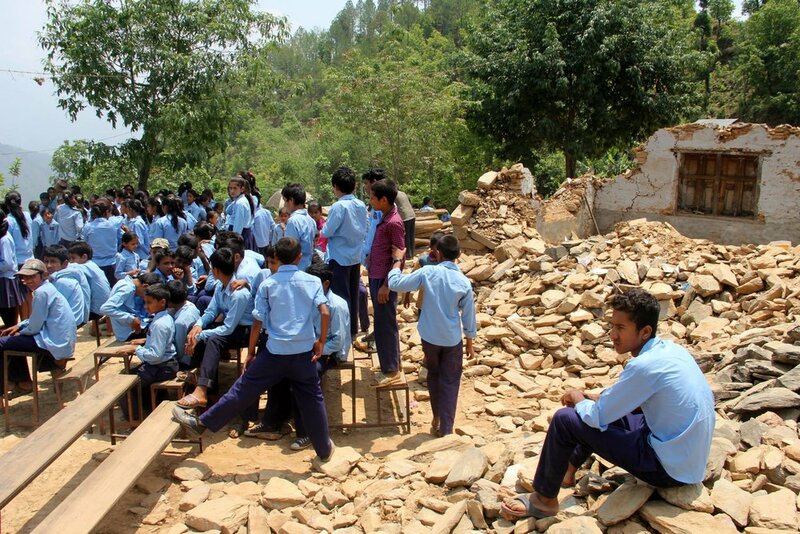 Following the Gorkha Earthquake, thousands of schools were left in a similar state as Shree Seti Devi, with walls crumbled but the foundation still in tact. Making use of the original school's foundation, windows and roofing allowed us to achieve considerable cost savings. Good Earth Global supervised the reconstruction of two homes for sisters Goma and Taku and their families, previously destroyed by Nepal's 2015 earthquake. The project was done in collaboration with the Conscious Connections Foundation, a U.S. non-profit promoting education among young Nepali girls and providing primary health care to rural villagers. 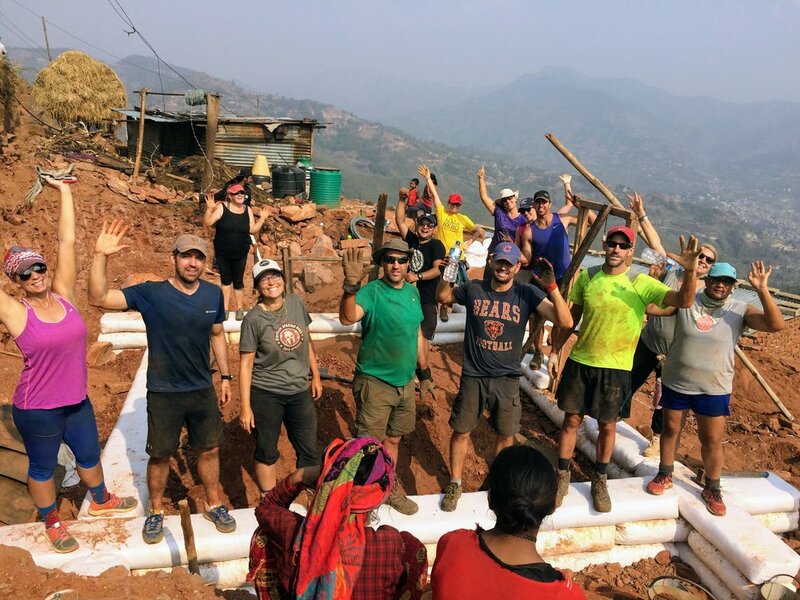 Good Earth Global partnered with German non-profit Carisimo and Kaule Environmental Nepal to design and manage the construction of six Earthbag homes using community-based model. With our supervision, six families volunteer for one another to build their own homes. Click Here to read the stories of some of the families. Find out about our organization, mission and team, and revolutionary Earthbag technology.